Branch Bench-Building At Army Labs - The Americans .US! 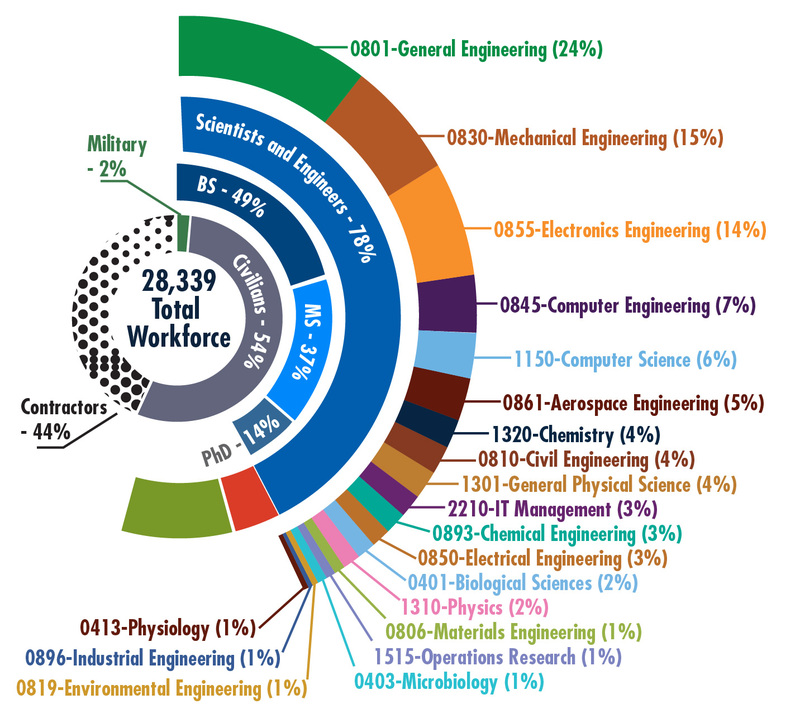 Attracting an elite cadre of scientists and engineers is essential for the Army mission; Army labs need to be able to offer better pay and shorter hiring timelines to do so. A core enabler for technology superiority in a constantly evolving and asymmetric threat landscape is technological excellence at the Army laboratory enterprise, empowered by a strategically shaped and highly competent technical workforce. 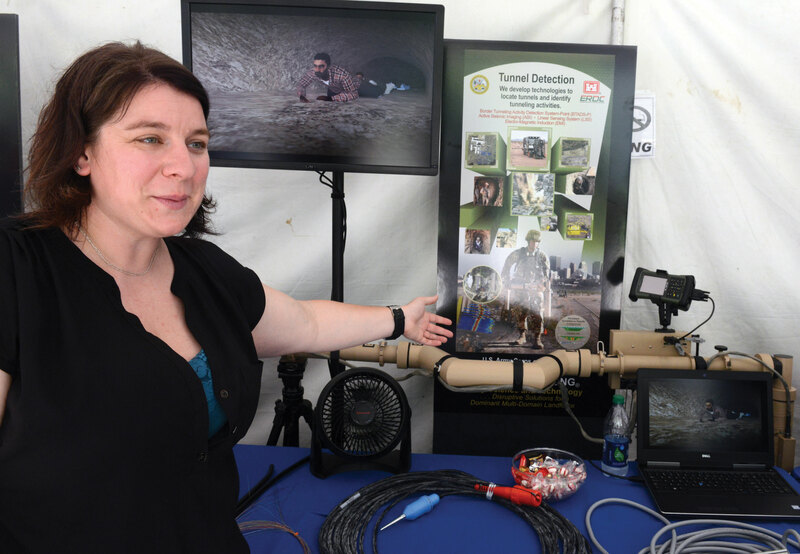 Attracting, recruiting and retaining an elite cadre of Army scientists and engineers is essential for success in the science and technology (S&T) domain that is critical to the Army’s mission. Army scientists, technicians, engineers and mathematicians—among other technical specialists—make fundamental S&T contributions to national security and to the nation as a whole. The Army must instill an open laboratory culture—steeped in innovation and collaboration, and a systems thinking approach—that is accommodating to creative, free minds and a stimulating atmosphere to break through the bureaucracy and attract future technical experts. The dynamic recruiting of high-caliber, future-focused STEM professionals, with timely initial hiring and flexible compensation. The responsibility, authority and flexibility for Army laboratories to manage workforce strength, structure, positions and compensation unencumbered by limitations on appointments, positions or funding. Talent management policies and strategies that fuel growth, innovation and market advantage with an agile and flexible operational structure designed to accomplish evolving S&T priorities. A robust group of senior STEM leaders to enable effective and efficient execution of S&T programs, with support from a balanced blend of administrative, technical and professional staff. The Army must instill innovative workforce management practices to empower the Science and Technology Reinvention Laboratories (STRLs) to be an attractive venue for technical careers. 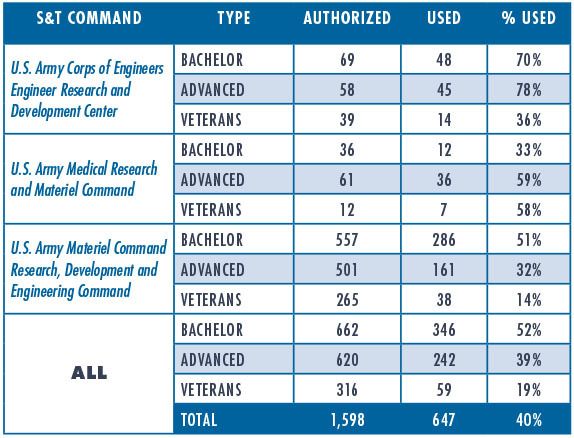 The Army STRLs—all Army labs that execute joint S&T funds are designated as such, which confers additional authorities in how they’re run—represent a unique segment of the broader Army workforce, including a highly educated, highly technical and highly recruited population. Recruiting and hiring into specialized positions within the Army STRL enterprise is often inhibited by the traditionally tepid hiring timeline and smaller compensation packages as compared with the private sector or academia. An innovative S&T enterprise requires an agile policy posture and hiring construct to attract, recruit and retain the current and future Army STEM leaders. Unique personnel and operational authorities are required for the labs to develop the S&T that is critical to success in the future asymmetric multidomain battle. In recognition, Congress established Section 342(b) of the National Defense Authorization Act (NDAA) for Fiscal Year 1995, which authorizes the secretary of defense to conduct personnel demonstration projects at DOD STRLs. The personnel management authorities granted in the original provision have evolved into a permanent, continuing program to give all Army labs the freedom to build the necessary S&T workforce without the constraints that govern most federal hiring. The STRL personnel management demonstration projects involve broadbanded pay systems and simplified classification; compensation linked to performance; recruitment and staffing changes; and enhanced training and development, including critical skills training, distinguished scholastic achievement authorities, modified term appointments, voluntary emeritus appointments, an entrepreneurial leave program and sabbaticals. To meet organizational and DOD-designated missions in the most cost-effective and efficient manner. To shape such workforces to better respond to such missions. To reduce the average unit cost of such workforces. Title 10 of the U.S. Code (USC), Section 2358a permanently codifies additional authorities for directors of the STRLs. The directors manage each STRL’s workforce strength, structure, positions and compensation without regard to any limitation on appointments, positions or funding and in accordance with the budget available to the facility. The directors are further authorized to implement a direct-hire authority, which expedites hiring by eliminating procedures such as competitive rating and ranking, and veterans’ preference. (See Figure 1.) All laboratories are under command-imposed hiring restrictions that inhibited full use of the direct-hire authority. Direct-hire authority has reduced the elapsed time between the close of the job application and the conditional offer to the candidate from more than 90 days to often less than 20 days. The Laboratory Personnel Management Demonstrations Project has allowed Army labs to remain agile and competitive with the private sector, providing job offers in a matter of weeks versus months, with the option to offer more competitive compensation. Congress has further embraced a future-focused STEM-oriented workforce and innovative laboratory enterprise by initiating a pilot program for operational streamlining of DOD laboratories. Section 233 of the NDAA for Fiscal Year 2017 challenges STRL directors to instill innovation in their organizations by streamlining management operations, rapid deployment of warfighter capabilities, experimentation, prototyping and partnership with universities and private-sector entities to generate greater returns on research and development activities. The Section 233 pilot program is a tailorable solution that will enable efficient and effective customization of activities such as facility management, construction and repair; business operations; personnel management policies and practices; and intramural and public outreach. The pilot program is authorized through the end of FY22. I’M WORKING ON TUNNELS. YOU? Structured organizations like the Army are constrained in their ability to evolve toward a flexible, cross-organizational STEM workforce. Cross-organizational workforce utilization allows the Army to broaden capacity for critical focus areas while increasing efficiency within each organization. Congressional leadership has recognized the unique personnel recruitment challenges at Army STRLs and has given unique hiring and retention authorities to the laboratories, via mechanisms such as the direct-hire authority, 10 USC §2358a and the Section 233 pilot program. However, challenges remain. Many STRLs remain subject to command-imposed hiring restrictions, inhibiting the laboratories’ ability to reshape the workforce and keep pace with the rapid change of technology. Every echelon of Army leadership must embrace a paradigm shift to a flexible Army operational structure, ensuring clear goals and personnel accountability while fostering a systematic approach that prioritizes success but does not punish failure. MATT WILLIS is the director for laboratory management in the Office of the Deputy Assistant Secretary of the Army for Research and Technology. As such, he shapes policies that impact the workforce, infrastructure, technology transfer and STEM educational outreach posture at the Army STRLs. He holds a Ph.D. and an M.S. in chemical engineering from the University of Illinois at Urbana-Champaign and a B.S. in chemical engineering from Cornell University. He is Level II certified in S&T management and is a member of the Army Acquisition Corps.